A Federal Capital Territory High Court sitting in Jabi, Abuja, has granted bail to Maryam Sanda, who was accused by the police of killing her husband. Justice Yusuf Halilu, granted the motion for bail yesterday after rejecting same on three previous occasions. After the court struck out Maryam’s last bail application on February 6, the matter was adjourned to March 19 for definite hearing. But Maryam’s counsel, Chief Joseph Daudu (SAN), approached the court with the fresh bail application and asked for an earlier date to move it. Counsel to the police, CSP James Idachaba, again opposed to the granting of the bail. However, Justice Halilu said the court was satisfied with the health reasons canvassed for Maryam, who is said to be over three months pregnant and also asthmatic. The judge held that the police were not able to counter the claims that the prisons’ health facilities could not take care of Maryam’s conditions. Justice Halilu ruled that Maryam should provide two sureties who must deposit their titles of ownership of landed properties in Abuja. He also ordered that Maryam’s father should enter into an undertaken to always provide her in court all through the trial. Maryam is standing trial over the alleged murder of her husband, Bilyamin, the son of the former chairman of the Peoples Democratic Party (PDP), Dr Bello Halliru Mohammed. 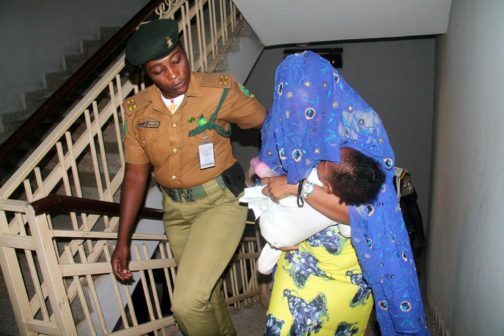 In count one of the amended charge, the police alleged that Maryam had caused the death of her husband, Bilyamin Bello, “by stabbing him on the chest and other parts of the body with a knife and other dangerous weapons which eventually led to his death.” The second count charge states that her mother Maimuna, her brother Aliyu, as well as one Sadiya Aminu, with the knowledge that a murder has been committed, “cause evidence of the offence to disappear.” The police alleged that the trio cleaned the blood from the crime scene with the intention of screening Maryam from legal punishment.